Vermilion Catholic has hired Kevin Fouquier to be the Screamin’ Eagles’ next head football coach, the school confirmed Friday. A formal announcement will be made when students return to school Monday following the holiday break. Fouquier, a 52-year-old from Franklin, Louisiana, has served as VC’s defensive coordinator for five of the last six years as a CECP-certified coach, which allows him to be on staff as a non-faculty member. He has a wealth of coaching experience at both the high school and the college level. Before joining the VC coaching staff in 2012, he was the UL defensive coordinator under Rickey Bustle for four seasons. Fouquier was one of more than 20 people who applied for the job, VC athletic director Kim Guidry said. Guidry, along with principal Mike Guilbeaux, was among a 10-person committee who vetted candidates. The school’s familiarity with Fouquier as both a person and coach made him VC’s first choice, Guidry said. Fouquier, who currently works for American Pollution Control Corp. (AMPOL), is expected to start at VC at the beginning of Februaryl. As either the defensive coordinator or a position coach, Fouquier had stops at Middle Tennessee, where he also served as the recruiting coordinator for three years, Central Arkansas, Louisiana Tech and Sam Houston State. He started his coaching career as a graduate assistant at UTEP in 1990 before becoming the defensive coordinator at Teurlings Catholic in 1991. He then went back to college, serving as graduate assistant at Texas A&M from 1991-1993. Fouquier replaces Brady Thomas, who spent one year with the program before leaving the school for personal reasons. 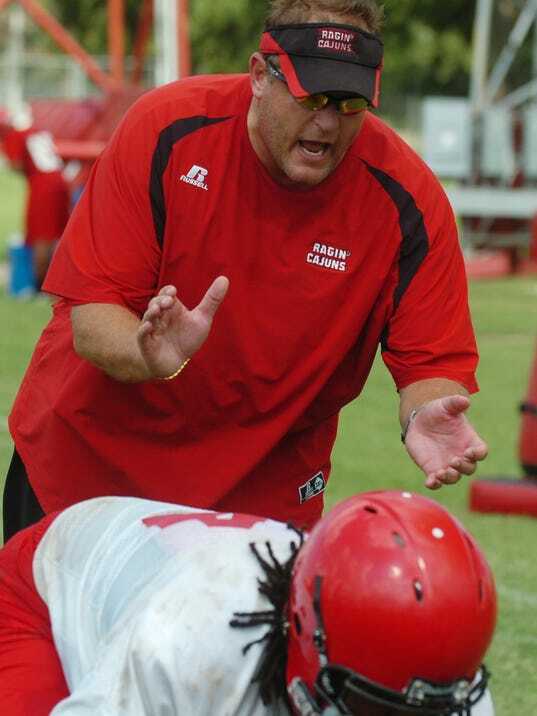 Thomas, the former UL quarterback who spent four years as a graduate assistant with the Ragin’ Cajuns, led the Screamin’ Eagles to a 8-2 regular season record and District 7-1A title in 2017. VC reached the semifinals of the Division IV playoffs, losing to league foe and eventual state champion Lafayette Christian. Fouquier is the Screamin’ Eagles sixth coach since 2011. Trev Faulk, now in his second year as the head coach at LCA, led VC to an unbeaten regular season and trip to the semifinals in 2011. But he left after one year to become the head coach at Northside. From 2012-2015, Russel Kuhns compiled a 44-7 overall record at VC, including going undefeated in 2013 and beating St. Frederick in the inaugural Division IV state championship game. Ossie Blaize, who coached VC from 1991-2000, returned in 2016 in an interim role after Kuhns' late departure. The Screamin’ Eagles went 4-6 a year ago, and Blaize remained on the staff as an assistant when Thomas took over. When Fouquier left UL, he became a salesman in the oil industry, but he actually declined an offer to become VC’s next head coach in 2011. It eventually went to Faulk. In 2012, Fouquier joined Kuhn’s staff at VC, doing so for two years. He didn’t coach at VC in 2014, taking that year to watch his son play football for UL, before returning in 2015. “I saw it as an opportunity to scratch my itch (of coaching) and help young coaches and help these young kids,” Fouquier said. When Kuhns left abruptly in the summer of 2016 for coaching job in Texas, Fouquier agreed to help Blaize because he was shorthanded. Prior to Kuhns’ sudden departure, Fouquier didn’t plan to continue assisting the program. He found himself in a similar situation in 2017, thinking he wasn’t going to continue as an assistant coach. But the man Thomas initially hired to be the defensive coordinator backed out a few days before the Screamin’ Eagles started spring practices, so Fouquier agreed to help again. Fouquier, who plans to hire former UL coaching colleague Gerald Broussard as his offensive coordinator, plans to remain at VC for a while. Click here for Kevin's Athletic Network Footnote. Click here , then photo #61 encouraging UL Football Coaches and #62 to view Kevin tailgating with Bryan Labit (Franklin natives) prior to the Cajun Walk in 2015.